So it’s time for packing and travelling and we all girls like to have plans when it comes to decide what to bring with us, we have essentials that need to come no matter what and always try and sort out a way to keep our makeup and skincare travel bags to the minimal when it’s needed. Now, I have a boyfriend and you probably already know that as you’ve met him several times on here, and despite he always makes fun of me for being too obsessed with beauty, he did a serious well made work with that travel beauty bag of his. I was so curious about what he was carrying with him when he spent less than a week at my place, that I had to sneakily take a peek at his stuff… and try something as well. Besides toothbrush and toothpaste, his loyal hair comb and his rather loyal Breeze deodorant which smells so good if you ask, he was carrying a selection of other essentials such as his Trichomania Shampoo which he always says it’s one of his favourites out of the Lush shampoos (and he has always been quite the fan of their hair products if you were wondering) and which I tried as well, found amazing and added to my list of things to buy from Lush, since I could die over its delicious coconutty scent! I actually tried pretty much all his hair products (wanted to understand his hair secrets, you know) and I would say we have such different hair types: he goes for the hydration all the way which is something I usually stay clear of, but that The Bluebeards Revenge Concentrated Conditioner* really called my name with that masculine grown up scent and apparently this conditioner is leaving his hair even softer and moisturized. It has a concentrated formula so that it will last a lot longer than any other conditioner, plus it really works wonders on his curly locks. Despite it looks like he really kept it to the minimal, he did it in the right way and I would love to be able to select only one product for category! He is a fan of the Nivea In-shower Body Moisturiser as much as I do as he struggles with dry skin every so often and in fact this is the product to carry for body moisturizing as it’s quick and easy to apply, but he’s also enjoying the The Bluebeards Revenge Post Shave Balm* as well which is a paraben free super nourishing balm that works at reducing beard growth while giving the skin back all what it needs and has lost during that shaving session. Body – Nivea In-shower Body Moisturiser, Nivea Creme Soft Shower Cream (mini size), Breeze The Verde 24h Deodorant, Dolce & Gabbana Light Blue Pour Homme Eau de Toilette Spray. Hair – Lush Trichomania Shampoo, The Bluebeards Revenge Concentrated Conditioner*, Schwarzkopf Silhouette Super Tenere Mousse. 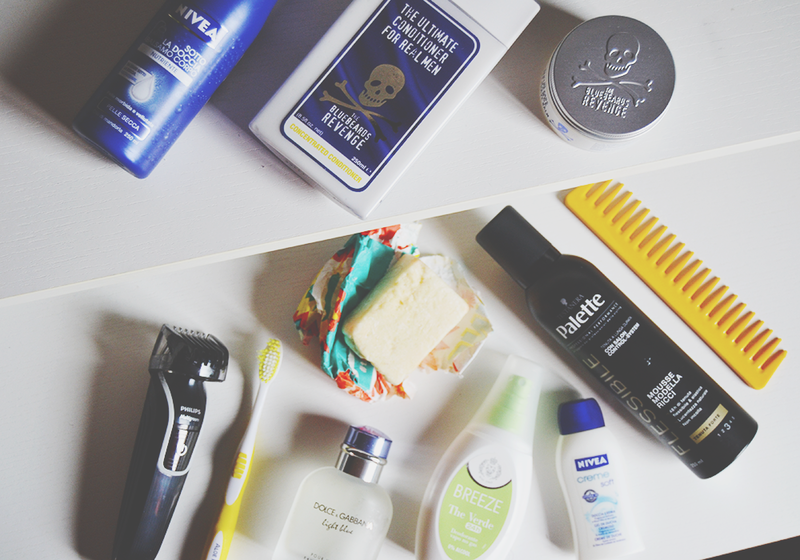 Skin – The Bluebeards Revenge Post Shave Balm*, Philips Multigroom Grooming kit. 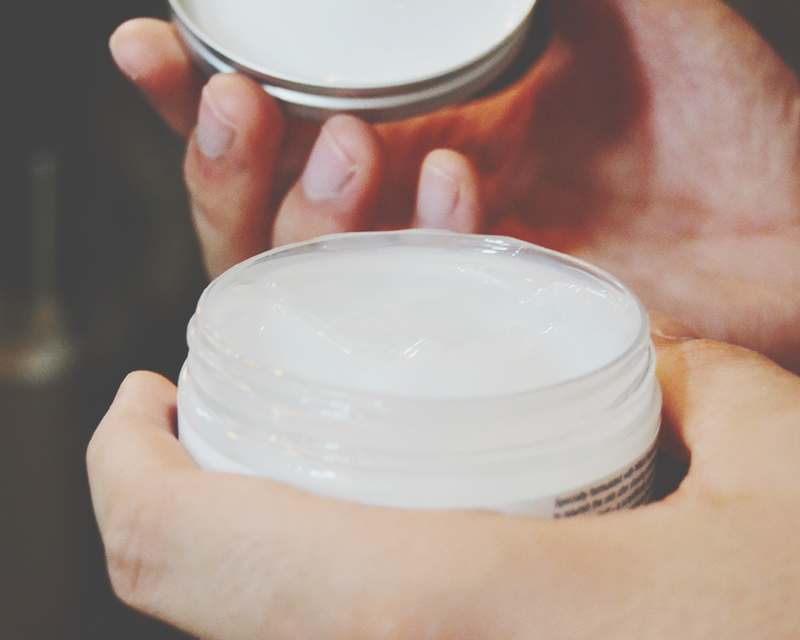 What’s is in your boyfriend’s travel essentials bag? I’m curious! I still haven’t tried Lush Solid Shampoos, but I’ll do it asap!